XL rear panniers for extended touring with lots of equipment; QL2.1 system for rack diameters up to 16mm, PU laminated Cordura fabric; integrated inner pocket; large reflectors; roll closure; outer front pocket (with reflective thread) folds flat, shoulder straps. If you sometimes have trouble deciding which extra T-shirts to take along, or whether you should take two pairs of shoes or three, you may want to switch to ORTLIEB because the world’s largest waterproof bike bags have plenty of space for everything you need. The Back-Roller Pro Plus is the XL version of the popular Back-Roller Plus touring bag. With a volume of 70 liters per pair, it offers almost twice as much stowage space. 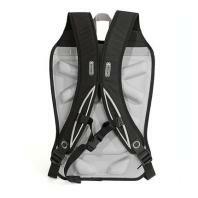 It’s also the first ORTLIEB Back-Roller with an additional front pocket. Although not waterproof, the pocket is unusually practical, offering 4 liters of space for water bottles, sunscreen, wet things, and other items. The durable Codura fabric gives the bag a noble, woven-fabric look, and is also completely PVCfree. The proven roll closure keep the contents of the inner compartment clean and dry at all times. Thanks to the ingenious QL2.1 system with its self-closing hooks, you can conveniently mount your bags on almost any bike rack.